A couple in love at the right place at the right time, girls captive to human traffickers and an impending storm that threatens all of their lives add up to quite a ride. 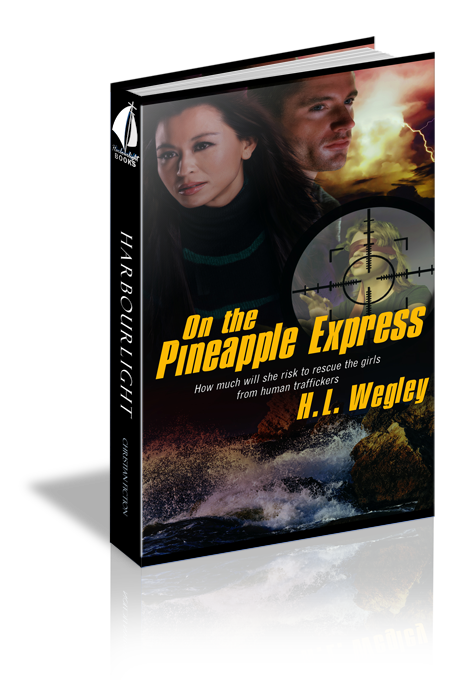 From the first line, H.L.. Wegley drops you straight into the action. Pineapple Express is enjoyable to read with plenty of action for the adventure lover and romance for those who enjoy that element of a story. Thoughout the book, there is an emphasis on doing things God’s way, whether it’s fighting for those who can’t fight for themselves or keeping oneself pure in a romantic relationship. In a few places, it felt like the point of the dialogue was to tell the audience something and other places the technical explanations went over my head. But neither of these bumps took away from my enjoyment of Pineapple Express. H.L. has weaved together an action filled story with purpose. I really appreciate how he has called attention to the awful reality of human trafficking and the need to take action.